You start the game, waking up after the party. You are in Vault 76 located in Appalachia, part of the former state of West Virginia, in the year of 2102, 25 years after the Great War. 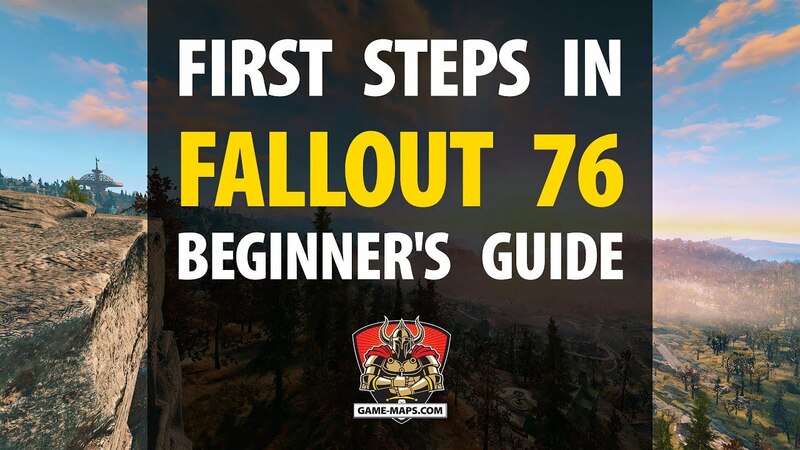 Vault 76 is the starting location for every character you create in Fallout 76. Inside Vault 76 you are completely safe, no one can attack you, neither monsters nor other players. As soon as you wake up after a yesterday's party, the first step is to choose the visual appearance of your character. You do not have to waste too much time on the appearance of your hero because during the game you will be able to modify your character's appearance freely and without any problems. During the game, you can change the appearance of your character for free at any time by entering the Game Main Menu and selecting Change Appearance. Bed There is a bed in the startup room. Resting in beds during the game, heals you slowly. A longer rest gives you bonus effects. If the mattress is dirty or lies on the ground, resting you can contract Disease. There are several items in the room, you can collect them, but none of them is especially useful. Guitar you can not take it with you but you can play it. Playing instruments helps you relax. Play long enough to gain a bonus effect. Access terminals to uncover useful information, unlock secure doors, take control of linked turrets, bots, and spotlights, or play holotapes. Some terminals will be locked with a password. To hack a locked terminal, you must have enough "Hacker" perks equipped to match the skill level of the terminal. Some terminals can hold holotapes. HolotapeH01 Holotape: Nuka Tapper - This is small game, it can be played on your Pip-Boy. Holotapes will contain information about the game world or lore, others will be about quests, and the next will contain games. Your Pip-Boy can be used to play any holotapes you discover. Some holotapes also contain games which can be played at certain terminals or on your Pip-Boy. Playing Vault-Tech games endlessly will increase your Perception. Pip-Boy is the most important item in the game. With it, you have access to all information about your character, inventory, quests and radio stations. Hold Pip-Boy activation button to toggle Pip-Boy light. Reclamation Day has finally arrived. It's time to leave the Vault and rebuild America! Main Quests - A set of plot tasks that will guide you through the land of Appalachia in the footsteps of Overseer Vault 76. This is the main storyline of the game. Side Quests - Additional tasks, not related to the main plot of the game, which allow you to earn rewards, equipment and experience. Daily Quests - Tasks similar to Side Quest only repeatable. They allow you to get raw materials, equipment and experience. Events are group tasks. You can do it yourself, but it will be difficult or with other players. You do not have to group anyone. If you see the Event marker on the map, just go there, eg using Fast Travel and follow the task sequence. Open Doors and go outside. The doors to other lodgings are closed, there is nothing interesting in them. Follow the Vault Boy cardboard figures. Love Note There is Love Note in the canteen on the table, but it's not important. Food and drink are important in the game. Try to be always full and sated. Collect every food and drink you find. Later in the game you will be able to feed the food itself. Starvation and Dehydration will never kill you outright, but they will make you more vulnerable to being killed from other sources, as your Health will always be dropping. Above 75 percent: you gain a "Well Fed" bonus that increases Health and Disease Resistance. Below 25 percent: you gain a "Famished" penalty that reduces your AP and Disease Resistance. At 0 percent: you gain a "Starving" penalty that further reduces your AP and Disease Resistance. You will also begin to take damage. Above 75 percent: you gain a "Well Hydrated" bonus that increases AP Regeneration and Disease Resistance. Below 25 percent: you gain a "Parched" penalty that reduces your AP and Disease Resistance. At 0 percent: you gain a "Dehydrated" penalty that further reduces your AP and Disease Resistance. You will also begin to take damage. Stimpack are very important, so they are very important but not easy to create or find. Use Stimpacks only as a last resort during the fight. Regenerate your health by sleeping or eating. Building is an integral part of the game. You will build your base, as well as armor or weapons. Therefore, collect all the raw materials you find. Scrap your Junk items at the crafting station or workbench and put away the obtained raw materials into your chest. Scrap materials weigh less than the whole item. Party Hat take it, its only cosmetic item. It will update Reclamation Day Quest. HolotapeH09 Holotape: Overseer's Log - Vault 76 - play it, eject and take it. The Construction and Assembly Mobile Platform. will allow you to build your own camp. You will always be able to Fast Travel to your camp. Here you can also respawn after death. When you move your C.A.M.P., everything has to be stored in a new area. Use this to establish a foothold whenever you're in unfamiliar territory. Here you will be able to build your critical cooking, Stash Box, and Weapons Workbench. Place and relocate the C.A.M.P. from the Pip-Boy. Do not build your the camp immediately after leaving Vault 76, wait for the plot of the game to familiarize you with the use of C.A.M.P. Now you can Pick a Perk - level your character. There are seven S.P.E.C.I.A.L. stats: Strength, Perception, Endurance, Charisma, Intelligence, Agility and Luck describing your character. At the beginning of the game, the value of each parameter is 1. Strength - Strength is a measure of your raw physical power. It affects how much you can carry, resistance and the damage of all melee attacks. Perception - Perception affects your awareness of nearby enemies, your ability to detect stealthy movement, and your weapon accuracy in V.A.T.S. Endurance - Endurance is a measure of your overall physical fitness. It affects your total Health, the Action Point drain from sprinting, and your resistance to disease. Charisma - Charisma is your ability to lead and help others. It allows you to share higher point Perks and also affects your rewards from Group Quests and prices when you barter. Intelligence - Intelligence is a measure of your overall mental acuity, and affects your ability to hack terminals, the condition and durability of items that you craft, and the return you get from scrapping. Agility - Agility is a measure of your overall finesse and reflexes. It affects the number of Action Points in V.A.T.S. and your ability to sneak. Luck - Luck is a measure of your general good fortune, and affects the recharge rate of Critical Hits as well as the condition and durability of items that you loot. You can assign 15 points to each stats, points are earned with levels, till 50 lvl. To equip Perk Card you have to spend stat points. New cards will be available to you as your character level up, also above 50 lvl. You cant buy Perk Cards. These Perk Cards you have, can be changed and configured at any time. None of the items bought in the Atomic Shop will affect the game. Their use is purely cosmetic and visual. So if you buy Clean Small Generator or Clean Purifier you will not be able to generate electricity or purify water until you have such items in the game, and these are just skins with a nice look. Players must be at least Level 5 to engage in PvP. Damage dealt to another Player is significantly reduced until both Players have hit each other. Once Players have hit each other they become Hostile to each other. Hostile Players show up as red dots on the compass. If you're in a Team, you count as a single unit for determining if you hit a Player and that Player hits you back. So, if you shoot a Player and that Player shoots any member of your Team, your Team is now Hostile to that Player. Killing a Player who is not Hostile to you will make you Wanted. If you are Wanted, you are considered Hostile to all other Players, and they can hit you for full damage. Pacifist Mode is an option to completely opt-out of all PvP activity. You will deal no damage to other Players, and other Players will always deal reduced damage to you. Messages intended for PvP activity are also turned off. You will need lvl 5 to use Pacifist Mode. To turn on Pacifist Mode, use game Settings / Game and then select Pacifist Mode. You can turn Pacifist Mode off or on at any time. Visit the locations around Vault 76, inside The Forest Zone until you reach level 10. Only then go further. The nearest town is Flatwoods, there you'll find some quests. You have completed Reclamation Day Quest. The Overseer set up a C.A.M.P. south of the Vault. If I follow the road, I can probably locate it. Would be logical to set it up near the river, so I should head towards that intersection.